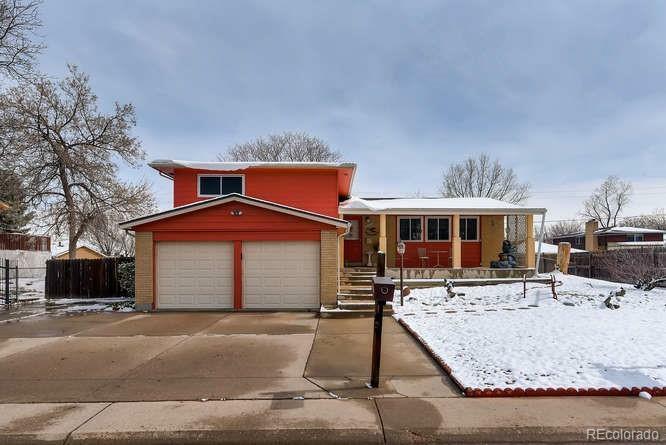 Wonderfully maintained home in desirable Northglenn West. The main level offers an updated kitchen with stainless steel appliances and custom cabinets, formal living room, and a formal dining area. The upper level features a large master bedroom with a private master bathroom, a full bathroom and 2 secondary bedrooms. Lower level boasts a large family room with fireplace, an additional bedroom, perfect for an office or den, and an additional bathroom. The finished basement has a large multipurpose room, ample storage and a large laundry/utility room. Ample parking with the attached 2 car garage, oversized driveway and space for RV/Boat. Newer custom windows throughout. No HOA. Enjoy beautiful Colorado mornings and evenings on the covered front porch or the private deck. Don't miss your chance to make this your new home. Wonderful neighborhood close to schools, parks, shopping and easy access to highways. Buyer to verify square footage.